'Tis the season for beauty bargains and value bundles! 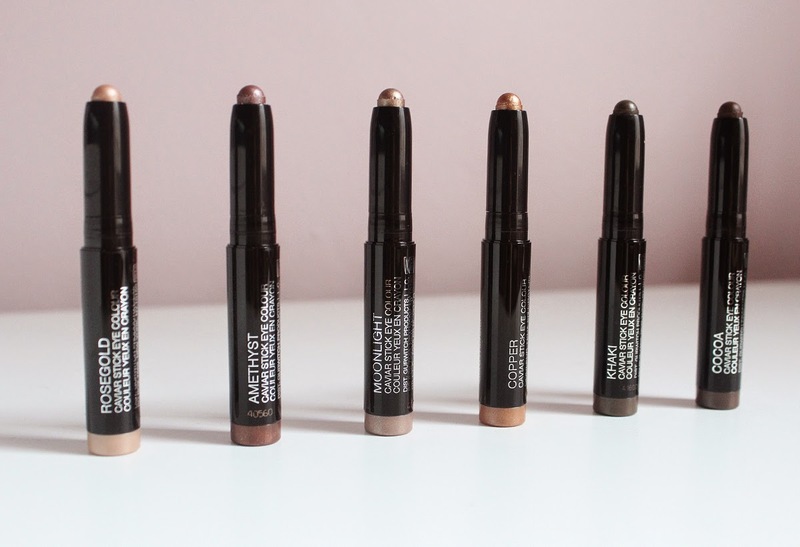 Today I'll be showcasing the Laura Mercier Mini Caviar Stick Collection, an assortment of six shades of creamy eyeshadow goodness. Right off the bat I'm going to let you know that this is a first impressions post and not so much of an in-depth review simply because I haven't had a chance to actually wear these beauties on my eyelids yet. 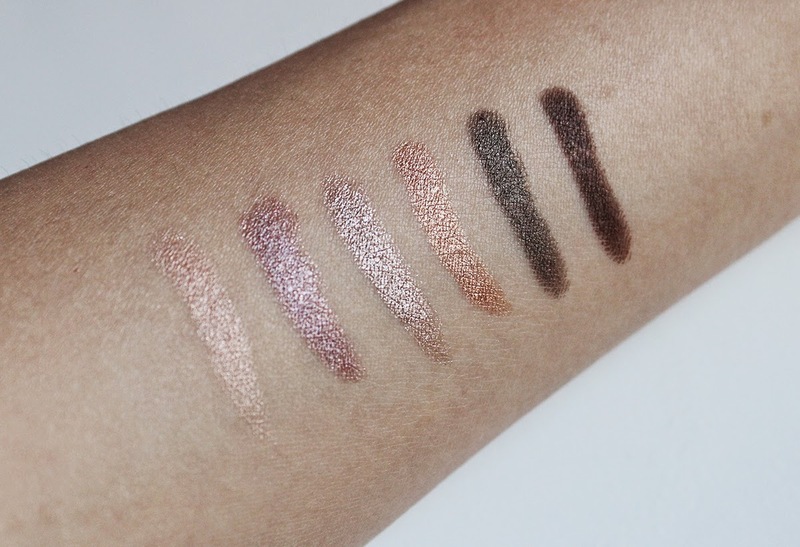 I saw the quartet version of these shadow pencils in Sephora last week and couldn't stop thinking about how pretty Moonlight and Amethyst were. I checked online and couldn't find the set on Sephora and ended up finding the set with six shadow pencils on Nordstrom for $55 with a 10% price match discount. I debated internally for a good hour or so before entering in my credit card details and hitting the order button.... But for six luxurious shadow pencils that I will probably never finish, $50 is a decent value. Each full size Caviar Stick retails for $28 and judging by how long the KIKO Long Lasting Stick Eyeshadows last, it's more worth it for me to get a variety of shades in mini sizes. Here is one of the eyeshadow sticks swiveled all the way up. It seems like very little product but a single swipe yields pigmented color. One shadow stick will last a long time and I rarely use the same eyeshadow daily. The packaging on these is exactly like the full size and feels sturdy although lightweight. Stick eyeshadows are my favorite for traveling because they take up no room at all and you can get a pretty wash of color with just one shade. Here are the beautiful swatches! The order is the same as how they come in the package: Rose Gold, Amethyst, Moonlight, Copper, Khaki and Cocoa. Rose Gold looks more like a champagne in my opinion and has quite refined shimmer. Amethyst is a very pretty light purple that I think will be very flattering against my brown eyes. Moonlight is another favorite because it is a light golden taupe with a metallic finish. This swatch does not capture the magnificence of Moonlight at all. Copper is a very warm gold that would look pretty in the summer. Khaki and Cocoa have little to no shimmer and would work well for a smokey eye. While I definitely didn't need this set, I'm very pleased with the shades and textures so far. No definitive word yet on lasting power yet but I will say it was a bit difficult to remove these swatches with just water after a couple of minutes. I have high hopes that these creams will last the entire day once they set just like my KIKO shadow sticks. In comparison to the KIKO shadow sticks, these are even creamier and lighter. The shimmers of the Laura Mercier Caviar Sticks are also more refined and multi-dimensional. In sunlight or a spotlight, the shimmery shades really shine and look stunning. 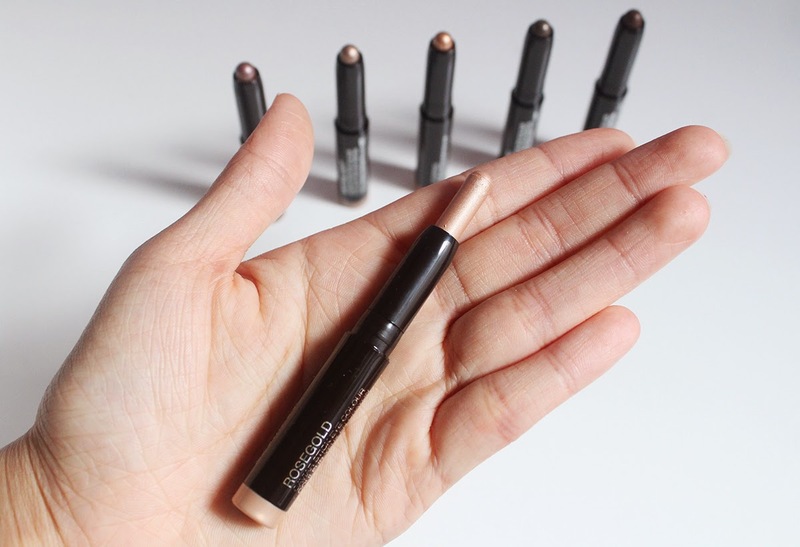 Have you tried the Laura Mercier Caviar Eyeshadow Sticks? What do you think of this set?